Mazda has given its Motability programme a spring boost with the inclusion of its all-new supermini model in the scheme. The all-new Mazda2 went on UK sale earlier this year and four models are now included in the Motability programme with the Mazda2 1.5 75ps SE air con manual available with nil advance payments. 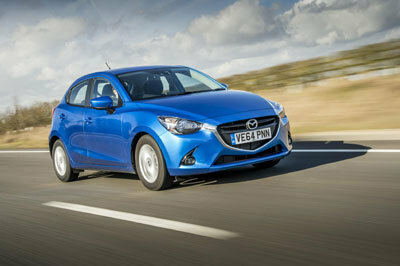 Other range models now in the scheme are the: Mazda2 1.5 90ps SE-L Nav, Mazda2 1.5 90ps Sport Nav and Mazda2 1.5 90ps SE-L Auto. On-the-road prices for the Mazda2 start from £11,995. The importance of the Motability programme to Mazda was underlined by the marque exhibiting at the recent two-day ‘Big Event’ in Manchester. It is Motability’s largest event of the year giving those in receipt of allowances the opportunity to view the largest display of vehicles available through the scheme. Visitors to the event were able to view the all-new Mazda2 as well as the Mazda3 and Mazda6 and to test drive the latter, which has recently been enhanced and now features improved standard equipment levels across the entire model range, enhanced interior and exterior design, plus improved functionality, ride comfort and quietness, and the adoption of several sophisticated new technologies in Mazda's optional Safety Pack. Mazda will also be exhibiting at Motability’s regional ‘One Big Day’ events at the Peterborough Arena, Cambridgeshire, on Thursday, 6 August and Stoneleigh Park, Warwickshire, on Saturday, 12 September. Meanwhile, Mazda, which is witnessing a significant sales increase across both the corporate and private sectors with new car sales up more than 18 per cent in 2015 versus an industry-wide increase of 6.4 per cent, has further boosted the appeal of its ever-popular Mazda3 and Mazda6 to Motability scheme participants. Both models, like the Mazda2, feature the brand’s breakthrough SKYACTIV technology, which delivers fuel-sipping performance and low CO2 emissions among many other attributes designed to keep running costs to an absolute minimum. The all-new lower medium sector Mazda3 was launched last year and six models are available in the Motability programme including the 120ps SE Nav manual with nil advance payments. On-the-road prices for the Mazda3 start at £16,995 and other models available are the: Mazda3 120ps SE Nav auto, Mazda3 120ps SE-L Nav manual and auto, Mazda3 120ps Sport Nav auto and Mazda3 150ps SE Nav diesel. The perennial family favourite Mazda6, available from £19,795, is featured in the Motability programme with a choice of nine models: Mazda6 Saloon 145ps SE Nav, Mazda6 Saloon 145ps SE-L manual and auto, Mazda6 Saloon 145ps SE-L Nav manual and auto, Mazda6 Saloon 150ps SE diesel, Mazda6 Saloon SE Nav diesel, Mazda6 Tourer 145ps SE-L, Mazda6 Tourer 145ps SE-L Nav. The entry-level Mazda6 Saloon 145ps SE Nav is available with an advance payment of just £199, a saving of £100 versus the first three months of 2015. Finally, the Mazda5 multi-activity vehicle is available on the Motability programme in a choice of 1.6 Sport Venture diesel and 2.0 Sport Venture derivatives with an advanced payment of only £499 for the latter featuring easy slide-door access. On-the-road prices start at £20,495. Mazda Fleet Marketing Manager Clare Marston said: “As always, our Motability campaign gives every accredited dealer the opportunity to offer Mazda vehicles in all of the core segments for Motability. She added: Mazda continues to reap the benefit of offering a comprehensive Motability programme and we are delighted to be able to offer allowance recipients a wide selection of models, many with nil advance payments.